From two of the masters of American jazz and theater music: eclectic, icon-laden explorations of two vast, imagined worlds. 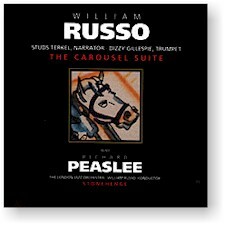 Best known for his prolific work with the Stan Kenton Orchestra, Bill Russo conjures up a parable of the stages of life in his Carousel Suite, adapted from his music for the animated film Everybody Rides the Carousel. It features the trumpet of the great Dizzy Gillespie and the narration of author/broadcaster Studs Terkel. Richard Peaslee has garnered acclaimed for his theater and film scores, including Marat/Sade. Here, he offers a big band interpretation of ancient pagan rituals in his symphonic jazz classic Stonehenge from a dynamic 1964 recording by the London Jazz Orchestra. Recorded on (#1-4) 15 August 1964 at Landsdowne Studios in London and (#5-14) 1 July 1983 at Olympic Sound Studios in London.